If Mickey Rourke was arguably, the most interesting actor of the 1980's, then Johnny Depp is arguably, one of the most interesting actors of his time. 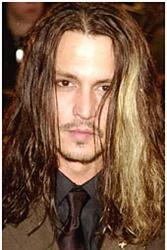 From his comedic turns in Arizona Dream and Benny and Joon to romantic leading man (Chocolat, What’s Eating Gilbert Grape, Don Juan Demarco) to horror star (The Ninth Gate, Sleepy Hollow), Depp’s career is quite remarkable in its diversity. It’s hard to believe this is the same actor who first gained attention in A Nightmare on Elm Street and the underrated teen youth drama, 21 Jump Street. As a film star, Depp’s big breakthrough came with his starring role in Tim Burton’s Edward Scissorhands with whom Depp has collaborated on three films in total including the brilliant Ed Wood, a film that gave Depp his best role to date—playing the demented but lovable real life filmmaker. Ed Wood could’ve easily become a slapstick comedy, just making fun of Ed Wood, but Depp’s sensitive performance turned the film into a hilarious, yet gentle portrait of a man’s soul. Though Depp has always prided himself on making risky choices, like Jim Jarmusch’s commercially poison western Dead Man, Depp has always been keen enough with his career to alternate between edgy, out of the mainstream material like Arizona Dream and Fear and Loathing in Las Vegas, with more commercial films like Donnie Brasco and Sleepy Hollow, understanding that box office success will allow him more artistic freedom. In Depp’s most recent film From Hell, Depp plays Frederick Abberline, the real life Inspector who was assigned the task of hunting down Jack the Ripper in the slums of Whitechapel more than a century ago. Whether you like all of his films or not, From Hell represents another risky, strange journey for this most interesting actor. What interested you about From Hell? I thought the script was amazing and I’m a big fan of the Hughes Brothers. I loved their last film (American Pimp) and I loved working with them. I also got the chance to smoke a lot in this movie, like in Blow. I don’t need an excuse to smoke in a film. You were interested in Jack the Ripper as a child? Yes, I was very fascinated by the subject of Jack the Ripper, I was obsessed, maybe I was too interested in him at such a young age. From then on I just found as much information on the subject as I could over the years. It’s the first recorded serial killer in history and the fact that’s it’s never been properly solved is really fascinating. Nothing like this had happened before on such a large scale and it’s still an unsolved case and it’s a case that will likely never fully be solved. Abberline is a very sick, tortured man in the film? Tell us how you approached the character. Even in the deepest and darkest kinds of things I try to find some humor and extract it. The character I play, Abberline, feels like he sees demons and visions in his search for Jack the Ripper. He’s a very damaged man, so in a way, from my point of view, it would make sense to show all of his scars and weaknesses. He has all of these demons, he abuses drugs, you show the addictions and the demons—as well as the hunt for the killer. You did a lot of research for this role, didn’t you? One of the things I was able to do was actually go and visit Whitechapel and see the real places where the killings took place. I also got to talk to all of these ‘Ripperologists’ and hear all of these theories about who Jack the Ripper may have been. One of the Jack the Ripper experts, he took me to all of the notorious landmarks, where all the murders happened. What did the Hughes Brothers bring to the film? They knew every theory in the film. They’re great. They know everything about what they’re doing. They study scenes. They told me that they had reconstructed Whitechapel for the movie, but I didn’t know just how far they had gone. It turns out you could see seven or eight blocks of the East End of London. It felt like stepping back into time. I was so impressed with the research they had done for the film. It was like watching someone solve a hard equation. Why is the legend of the Jack the Ripper still so fascinating? It was the first case where a faceless killer had been elevated to the status of pulp icon. He became a worldwide curiosity. So From Hell was a much happier experience than The Astronaut’s Wife and The Ninth Gate? Tell us a little about working with Tim Burton. I’d love to work with Tim again. Tim’s a true artist, very true to his artistic vision, to his emotions. He’s proved that you can do things differently and still be successful. On Sleepy Hollow I thought I was going to get fired because I didn’t think there was any way they were going to let me play the character that way, but Tim was very supportive. The same was true with the Hughes Brothers. Anything they did, I’d work with them again.